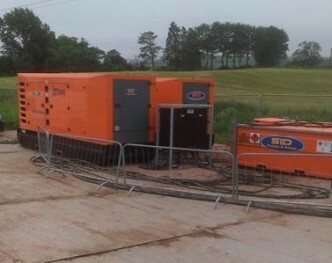 SLD’s Shona Montcrief commented “our generators get used for a huge variety of mission-critical work but when the result is in and the client is as satisfied as this, it is hugely rewarding for everyone in the office”. Test pumping, as it is known, follows a critical path and one of the main criteria is that the test must not be stopped at any point during the process. The main cause of stoppage is generally failure of the power supply. The SLD generators were used to run a Lowara L12W1850T405/A 12″ borehole pump, suspended from an 8″ Wellmaster rising main. The pump was powered by a 185 kW electric motor, which delivered in excess of 140ltr/sec of water. 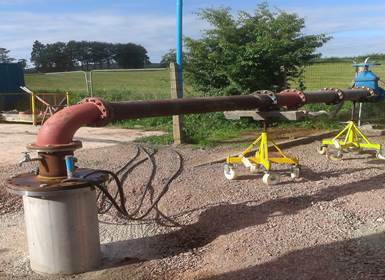 Due to the high flow rates and large diameter pipe, ultrasonic flowmeters were used and real time test data was sent to the client electronically – keeping them abreast of results continuously. Discharge lines which disposed of the pumped water locally to surface runoff channels were set up to distribute the water to various locations so as to minimise the possibility of erosion, which can occur if large volumes are deposited in one area. The tests proved that the borehole could yield in excess of 1.4M litres of water per day without any adverse influence on any surrounding water features or abstractions.